1 of 4 Heat a large pot of lightly salted water to boiling. Add spaetzle and cook 25 minutes, following package directions. 2 of 4 Meanwhile, combine 1 cup of the mushrooms, the shallots and garlic in a food processor or mini chopper. Pulse to finely chop. Transfer to a large bowl and add ground beef and pork, bread crumbs, egg, dried sage, salt and pepper. Mix just until combined. Shape into 32 meatballs, using 2 tablespoons mixture for each. 3 of 4 Heat oil in large, lidded nonstick skillet over medium-high heat. Add meatballs to skillet; it will be a tight fit. Brown meatballs, turning occasionally. Slice remaining mushrooms and add to skillet with all but 1/4 cup of the beef broth. Cover skillet; reduce heat to medium-low. Simmer 15 minutes. 4 of 4 Mix flour into reserved broth. With a slotted spoon, remove meatballs from skillet. Stir flour mixture into skillet. Simmer 3 minutes, until thickened. Drain spaetzle. Transfer to a platter. 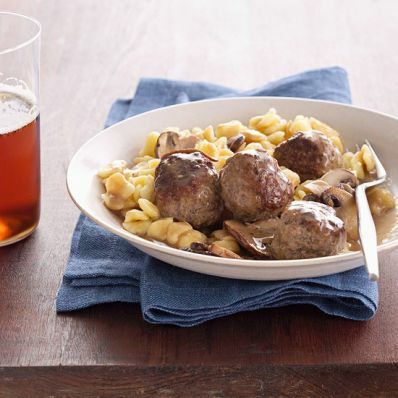 Stir meatballs back into sauce in skillet, then spoon over spaetzle and serve.